We believe simplicity is the key to healthy, beautiful skin. 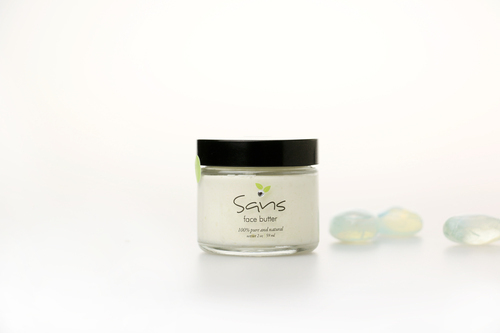 Sans Whipped Face Butters are made with only the finest, purest plant oils and butters. Plants are composed of the same vitamins, minerals, amino acids, essential fatty acids, enzymes, and hormones that we are. Our body recognizes plants as nutrition. We never add preservatives, emulsifiers, or any synthetic ingredients. Use morning, night, and throughout the day as needed. Since our Whipped Face Butters contains no water as filler, the butter is very concentrated. Use very little, if it feels too greasy then you've used too much. Your skin will tell you just how much to use. Avoid getting into eyes. Avoid getting water or wet fingers into the jar. Ingredients: Hemp Seed Butter, Horsetail Butter, Rice Bran Oil, Apricot Kernel Oil, Coconut Oil, Vitamin E Tocopherols, CoQ10, Carrot Seed Oil, Patchouli Oil, Frankincense Oil, Ylang Ylang, Geranium Oil, and Essential Oils for scent.